These are some of the help files for the fighter and rogue abilities online. More complete lists are available online. 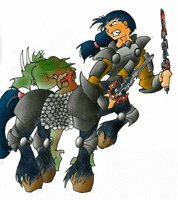 Fighter classes include mercenaries, berserkers, paladins, anti-paladins, rangers and warriors. Rogue classes include thiefs, assassins and bards. This is the ability of a fighter to ride a mount into battle. The greater this skill the more likly a rider will be to hit an enemy with his charge or rush and the more damage he will do.